This log home is situated at the base of the Sawtooth Mountains just outside the rustic town of Stanley in the heart of the Sawtooth National Recreation Area. 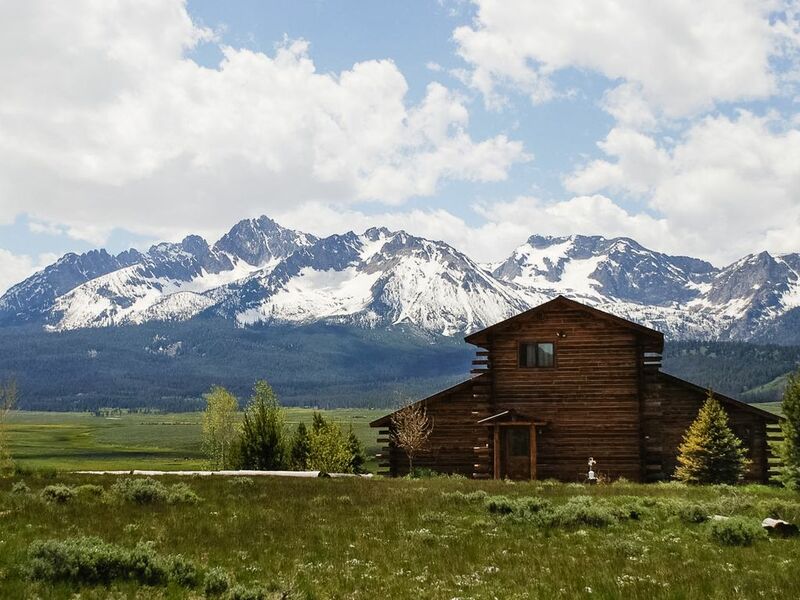 It has one of the most spectacular views of the Sawtooth Mountains as any property in the area and offers guests luxury, privacy and affordability. The living room, dining room, master bedroom and bunk room each have large picture windows looking out toward the Sawtooth's so they can be enjoyed from sunrise to sunset. The master bathroom has a jetted tub with barn doors that open to the master bedroom and look out toward the mountains as well. It is tastefully furnished with hand-made log beds and a 680 sq. ft. iron wood deck with picnic table and benches. The property is a mecca for white water river rafting, kayaking, mountain biking, rock climbing, blue ribbon fly-fishing, steelhead fishing, hunting, hiking and horseback riding. There are over 60 miles of groomed snowmobile trails in the winter and countless areas for snowshoeing and cross country skiing. It is 10 minutes from Redfish Lake Lodge offering boating, water skiing, canoing and swimming. This property is perfect for anyone who wants to get-away from the city to relax and enjoy the outdoors and yet is an easy one-hour drive over beautiful Galena Pass to all the amenities and activities of Sun Valley. We accept minimum 5-night stays for summer reservations booked prior to April 1st. After April 1st we being accepting minimum 3-night stays for the summer season. Sawtooth Vista Rentals is a family business run by a mother and her son who love the beauty of the Sawtooth Valley and wish to share that love with others. We have vacationed in Stanley every summer for over twenty years and have been property owners for the last ten. It is our own positive experience with offering our home in Stanley as a vacation rental which provides us with the experience to understand what is important to homeowners and renters alike. toilet, combination tub/shower, jetted tub, Jetted tub has barn doors that open to the master bedroom. 2 full baths, each with a tub/shower combination. Master bathtub is jetted and opens into the master bedroom through barn wood doors. Walking distance to local restaurants and bars. Unobstructed view of the Sawtooth Mountains from every room. Large 850 SF deck to enjoy the propane gas barbecue as you relax. Additional baseboard heating in each room. The open kitchen looks out to the living room, the dining room and the unobstructed view of the Sawtooth Mountains. Dine inside or out and enjoy the mountain views. There is a large picnic table and benches on the 800 SF deck. There is no TV service; however the TV is good for streaming movies and watching DVD's. Hand-made log beds throughout, bunk room with 4 large log bunk beds doubles as the DVD room and/or play room and could easily accommodate additional sleeping space for children with sleeping bags, 680 sq. ft. iron wood deck with picnic table and benches, barn doors in master bath open to master bedroom and out to the view, a view from every room, tastefully decorated throughout, excellent for a family or a couple families traveling together. This home has an unobstructed view of the Sawtooth Mountains and plenty of privacy. Beautiful clean home with an out of this world view. We had a wonderful trip to Stanley and the Sawtooths and enjoyed immensely our stay at this gorgeous VRBO. The pictures do not do the view justice - the view from the backyard is incredible, and probably the best view you can find for a rental in the area. The home itself was comfortable and perfect for a family or really anyone trying to enjoy the area. You are right in town, but still relatively isolated from other homes, and this is a convenient gateway to the area. Make sure to check out the stars at night! The only reason we didn't give it a 5 was some of the surfaces could have been a tad bit cleaner when we arrived (nothing too glaring and not a big deal or reason not to book this home). The manager was responsive and helpful and also made this a good experience. We appreciate how quickly they followed up with us when planning the trip and afterward. We would definitely recommend this as a place to stay and would book again if coming to the area. The home was clean and well decorated with comfortable furniture. We had a wonderful stay. We will definitely return. The only thing that would substantially improve the property is the addition of a hot tub! Overall, could not have done much better than this place in Stanley. This beautifully designed and constructed log home has stunning views of the Sawtooth Mountains! The expansiveness of the glass in the living and dining areas provides a feeling of enormous spaciousness, plus it’s fabulous to eat meals out on the deck and take in the most beautiful views imaginable, including incredible sunsets and lightning storms. The master bedroom and upstairs bunk room also have lovely views. The house is extremely comfortable, and everything is first rate from the linens to the pots and pans. One of our favorite vacation rentals ever – and we’ve stayed in over 12 beautiful homes in the US, Europe and Asia. We stayed here and loved it. The setting is perfect and few places in Stanley offer a view like this place. With only a short drive into Stanley, and easy access to everything there is to do in the area, this home was perfect for us to enjoy the beautiful area. We highly recommend it! A signed copy of the attached rental agreement is required with all reservations. Please download the agreement, read it, sign it, and send the signed agreement to: Sawtooth Vista Rentals, P.O. Box 123, Stanley, ID 83278.